Chelsea Gibson paints portraits of home. Home for the upstate New York artist is not a static entity; it cannot not be measured in square feet or valued in dollars. Rather, home is a feeling—something experienced—that roots itself in a person’s relationship to space, time, things, and people. To capture and emit the performative sense of the home, Gibson loads many of her paintings with what some would call quotidian clutter, but that together speak volumes outside of the singular moment being painted. While all of Gibson’s subjects are in some ways defined by and also defining their surroundings, the real potency of the artist’s work resides in her own (seemingly unseen) presence. There is an intimacy in the paintings—a deeply personal and profound attachment to the people, things, and spaces depicted—that takes on an almost Proustian quality in the age of social media. In this way, the work is a meditation on life—on our relationship to our surroundings, but ultimately, on our relationship with ourselves. 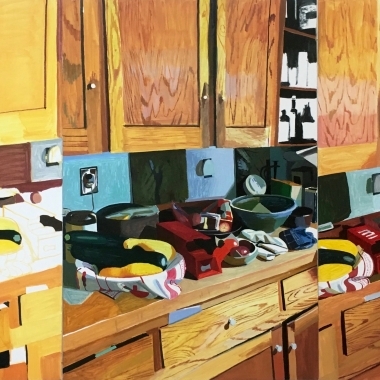 On the surface, Gibson paints very tangible portraits of people and objects in their homes. From this stems a deeper, reflexive awareness of the performance of living that defines “home” as a state of harmony—as the alignment of person, place, object, and time. Whether in her own home or someone else’s, Gibson’s portraits and still lives express feelings of loss and love, empathy, and acceptance of the human condition.The show commemorates a year of soul-searching for the artist, following personal loss. The most recent work starts to focus on the artists own home, giving the sense that Gibson is not just looking outward for guidance anymore, but discovers that home is internal. Perhaps after a year of searching, she finds home is right where she is. Chelsea Gibson received an MFA in Painting from Boston University, Boston, MA and is a graduate of the Rhode Island School of Design, Providence, RI. Her artwork has been exhibited throughout New York State, Boston, MA and Providence, RI. An accomplished musician, Gibson studied cello at the New England Conservatory of Music in Boston, MA. She lives and works in Gilbertsville, New York. DOWNLOAD PRESS RELEASE "My Kitchen Table"
DOWNLOAD PDF CATALOG "My Kitchen Table"